The Bullion Knot is a fun stitch to have in your stitch repertoire. I especially like to make cute (slightly kitschy) roses with them. Now the Bullion Knot is feared by some stitchers but it's really not an incredibly complicated stitch to learn. I'm not claiming that my Bullion Knots are perfect, and I'm the first one to admit that the way I make them is a bit awkward but I hope this 'how to' will help one or two stitchers out there to overcome their fear of Bullion Knots! In a next tutorial I will show you how I make my Bullion Knot roses. Milliners needles will make it easier for you to make a Bullion Knot (and French Knots as well). The eye of a Milliners needle is just as narrow as the shaft which makes it easier to pull through when you are making the actual 'knot'. Milliners needles are also longer than regular needles which makes wrapping your thread around the needle easy peasy. Now if you don't have a Milliners needle at hand, don't worry I have made Bullion knots with other types of needles too. Just make sure the needle isn't too short or has a 'bulky' eye. Let the thread come up at A. 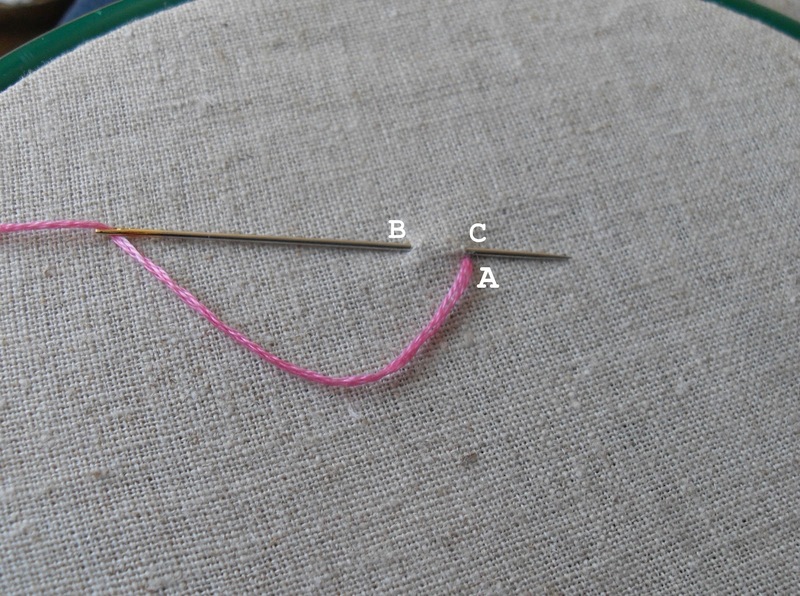 The next step is to insert the needle at B ( and let it come up again at C. Hold the eye-end of the needle down with your thumb so the upper bit of the needle comes up and start wrapping the thread (that comes up at A) around the needle 4-6 times (to start with) clockwise. ...and it should then end up looking something like this. To secure the knot insert the needle at B again. Now if you want to make a curved Bullion Knot (which is handy if you want to make Bullion Knot roses for example) you need to increase the number of wraps around the needle while keeping the distance from A to B (or B to C) the same as with the regular Bullion Knot. Mmm in yellow they look a bit like maggots to me! The more wraps the curvier your Bullion Knot will be! I exaggerated a little bit to show a really curvy Bullion Knot and wrapped the thread about 15 times around the needle. To make a Bullion Knot Rose you will probably be better off with a little less curvy Bullion Knot. I will show you how to make Bullion Knot Rose in a next tutorial! Let me know how you get on the with the Bullion Knot! I haven't made them because I've always thought I'd mess them up, but you make it look so easy! thanks for the tutorial! I think the trickiest bit is the part where you pull the needle through the wrapped thread but I hope my description of that particular bit makes sense. 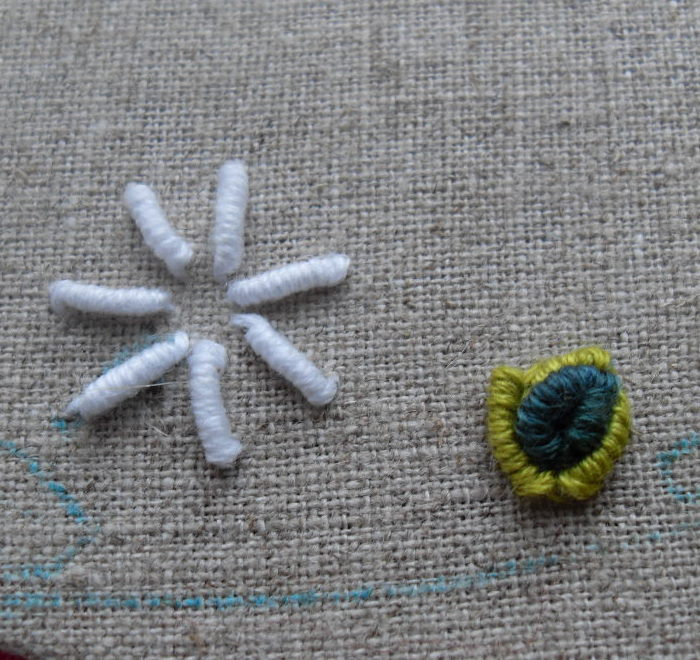 :) Would love to hear if you manage to learn this stitch with my tutorial! Great tutorial. It's one of those stitches that needs a really stepped out explanation. Awesome job! Thank you for the great description! I love this tutorial... I had completely forgotten how to do this stitch... Thank you! This stitch has always stumped me ... thank you for the excellent instructions ! I've done some but still working to "polish it up". Can you tell me what size milliners needle you prefer for bullion stitches? Great tutorial! Two nights ago I went searching for a unique stitch to use as an outline for a crown on an angel, and came across the bullion. I tried it, loved it and am quite happy with the end results! I'm combining it with the Pekin stitch as a filler. Im having a blast learning new (new to me) stitches.